Fully equipped comfortable accommodation, sleeps 8, with panoramic views of the Perthshire hills. Ideally situated for walking, fishing and touring Central Scotland. 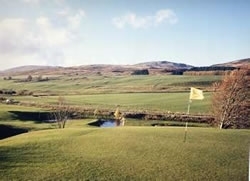 20 minutes drive from Gleneagles - 2014 Ryder Cup venue. Perfect location for both families and golfing parties. Situated at the edge of the Highlands, Foulford South Wing provides an ideal opportunity to enjoy the scenery of Highland Perthshire. Guests have unlimited use of our on-site par three 9 hole golf course. The owners are only too happy to assist guests with information about the local attractions and activities - everything from quad biking to fly-fishing. Golf tickets and tee times booked on request. Only ten minutes from Crieff with ample shops and restaurants and a lovely park for the youngsters. Very central location: Edinburgh, Glasgow, Oban, Perth and Inverness all within easy access. Great location in peaceful rural surroundings. Please note - Rates given are a guide only and based on weekly occupancy. For exact rates and short breaks tariff please go to our web-site.